Julie Gillies Julie Gillies - Pray It. Know It. Believe It. : Book Launch Day! I’ll never forget walking from the bedroom toward the bathroom that day many years ago, when I first sensed God prompting me to begin praying—for myself. I got the distinct impression that if I did not begin seriously and regularly praying for myself, I wasn’t going to make it. So, I started. Not because I was a holy woman, but because I was a desperate woman. Desperate for my miserable marriage to change. Desperate for the wounds in my soul to stop throbbing. Desperate to feel loved. Desperate to be a good mom with a good attitude. Desperate to actually feel joyful. I needed to know how much God loved me. I needed to experience His healing, His joy, and be equipped with His strength and peace while I walked through life’s hard places. And all of that began happening when I made the commitment to regularly pray for myself. So you see, I didn’t write Prayers for a Woman’s Soul because I’m an impressive theologian with several letters after my name. I wrote it because I was a desperate woman with real problems, real issues holding me back, and real desire to experience more of the freedom and healing I kept reading about in the Bible. 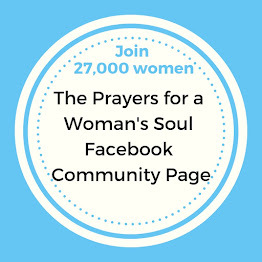 If you’re feeling overwhelmed, discouraged, and could use a soul-changing boost, or even if you’re life is so crazy-busy you simply never thought to take time to pray for yourself, I’d like to invite you to indulge in Prayers for a Woman’s Soul. Because praying for myself not only helped me, it transformed me. And I’d love to accompany you through this 52-week devotional. Prayers for a Woman’s Soul is available at Proverbs 31 Ministries, Barnes & Noble, Amazon (Amazon sold out but more books are expected soon), and anywhere books are sold. 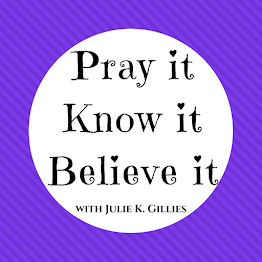 Julie, I pray regularly for myself, too (I need it!) and one thing I pray about is being able to discern the voice of the Lord. Sometimes I have a hard time deciding if a message I'm hearing is my own thoughts or the Lord's voice. I'd love to win a copy of your book! :) Good luck with the launch! Hi Julie, I need pray for this Bible study I'm leading with your book. I tried to post about it on my blog yesterday, and you wouldn't believe the problems I had. The post published, but you couldn't see the text. I've never had this happen ever!!! Please pray that I can fix this problem, and that the ladies that God is calling to join me will sign up. And as for a personal prayer, I could use prayer about being delivered from perfectionisn! 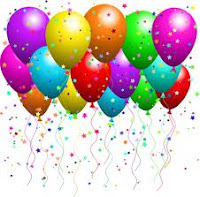 Congratulations on your new book Julie! I've already started reading it, and am finding it very helpful. Sure hope I'll be able to get another 10-15 copies for my girlfriends who will need it to do this study. We start on tuesday, 2/19. I need to learn to pray for my husband and my marriage, we don't really get along and at this point we are together because of our children. This past year that I have been going to Church has been amazing and I have learned so much but this is one area I have yet to aggressively confront and it is time, I need to experience healing, joy, love and hope. I am so thankful for my emails that send me your blog, it is direction that I haven't had before, thank you so much!!! I can't wait to read your book! You are right, as women, we sometimes forget about ourselves in trying to take care of everyone else. This will be new for me: praying for me! I'm praying that I will "really hear" the Holy Spirit speaking to me. Excited for your launch day, Julie! Praying for my mind, specifically my critical thinking. I just read your day 5 about the Christmas tree redecorating that your daughter thought was great while it had become an added chore to an already full list. I am about to "lose" my youngest of two children to his adventure of his adult life as a college freshman and am not looking forward to just me and my somewhat crabby husband.....or is it my attitude that makes him look crabby. (and yes I have already looked and will be printing your downloads for praying for your husband). So I need to learn how to pray for discernment of what my next role will be as I no longer need to primarily be a mother with the additional need of how to find the joy that I believe still lingers in our marriage. Thank-you. I am so glad that Proverbs 31 put a link to your blog. I started doing your 5 day devotional, and it has been so helpful. Recently I have hit burnout and being able to take just one verse and thought to think on for the day has helped. I need to pray for me to allow myself to slow down and heal right now. I pray for faith, an open heart, and the ability to hear God's voice....so that I may be used for His good. Thanks for sharing your journey, Julie. 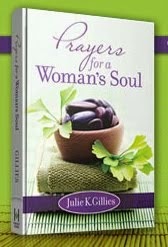 I'm sure many women in difficult places will be tremendously blessed as they grow closer to God through this book. Thoroughly being encouraged by my copy of your book! If I won a 2nd copy I would give it to my mom...who prays for everyone else, but forgets to pray for herself. :) THANKS for writing this book, Julie! You are such a blessing! There are lyrics in a Third Day song that go like this: "Oh, I don't want to let go, of all the things that I know, are keeping me away from my life." I feel the spirit nudging me so strongly, and I know I have more work to do for God, but the daily struggles of life keep my feet mired in clay. I feel the prodding but not the direction, do you know what I mean? I do not pray for myself. I so need to learn how. I stay so busy praying for everyone else I forgot me. Have a page in my prayer binder with each one's name, but not me. That's about to change and I can't wait to share with my Bible Study group. I am praying for my heart to continue to love as I lead my group and as I teach at school that God will continue as He has this past year to tender me to love, love, love. I have changed from an extrovert to an introvert who wants to be around people that they might get a glimpse of Him through me. I can't wait to go make my page in my prayer book. Thanks for sharing. I always need more wisdom and discernment. As the other lady mentioned, I want to be sure it is God's voice and not something I made up in my mind using my limited knowledge. God knows the Big Picture of our lives and I want to be led by His perspective and not by my circumstances. Blessings !! I like you, want to start praying 1st about my mind! However, I really need it more than the average person cause I had a Brain Injury 5 years ago & I am starting to get better thinking processes so I pray I give my mind a good start and stay with it. Prayer to take negative thoughts captive! My family is making a move and we are praying for God to show us where He wants us to go and what He wants for us. I pray to be filled with the Holy Spirit each day. for strength and courage, to see others as God sees them. I'd like to pray more effectively for your home to sell so we can move somewhere that I can get outside more often. I'm allergic to so many things here I have to stay inside most of the time. My prayer for a quiet and gentle spirit enables me to see God's hand in the dailiness of my life. I want to pray for my mind--my thoughts. That is where I focus on disappointment, lonleness, etc. OR . . . . on His promises from the Word. I really want my heart to seek His & not earthly fulfillment. Thanks for your insights on contentment. Freedom from fear so that I see and rejoice in the plan and purposes of God for this season of my life. Thank you so much, Julie, for all the encouragement you share. Prayers not for my husband to change, but for me to change...the way I see him, the way I react/respond, learning how to better pray for him. I feel like I am in a transition period...things around me are changing. I want to pray for God's direction in my life so I will be serving Him better. Funny, my first thought was peace of mind too. I want to pray that with God's strength I can resist negative thoughts of myself. I want to pray for my overall health and my state of mind. For myself I will be praying for a gentle and quiet spirit, control of my mouth, and being the Titus 2 woman the LORD wants me to be. Thank you Julie for the thought to pray for myself, I have never thought about that, praying for so many others all the time, other than confession I haven't really prayed for myself. I will be doing that now and look forward to reading "Prayers for a Woman's Soul"
I've always thought it be selfish to pray for myself. 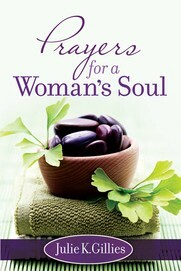 I would love to read "Prayers for a Woman's Soul. Praying for wholeness in our minds is one of the most important things we can do, I think. I have done this over and over through my years walking with the Lord and I cannot begin to explain how much it has changed my life. I don't regularly pray for myself, well not intentionally, purposefully, but I am starting! I love this concept and believe that we only can truly change as we walk closer to our Savior and let Him heal all of the broken pieces inside of us. I came to him completely broken, and He has faithfully restored the years the locust have eaten. And continues to do it every day. 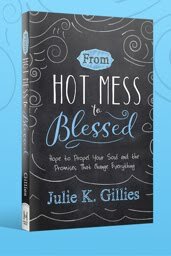 I am praising God for women like you, Julie, who take that broken place, own it, and then share the process of healing. God bless you for your courage and for the desperation that brought you to real freedom. I usually forget to pray for myself by the time I get through my prayer list for others; however I really need to start praying for my health. I am so glad that I have found your blog. I do pray for myself. My prayer is that I will learn to listen instead of doing all the talking during my prayer time.